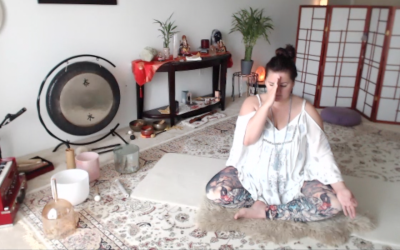 Before and After MELTed Self Care and INSPIRED YOGIS May IG Challenge! Part of my MELT treatment today included lower body length with my hips on the roller. I’m so grateful for the removable cast because it allows me time on the bed without it – it can breath and come alive again and feels awesome! I’m super careful and full of props, and I also love to put my foot flat on the bed, or how ever flat it’ll go to encourage the neurological feedback. The pic on the left was taken while I was MELTing, and I thought it looked too wicked to post! So, as to not freak people out, after I finished my therapy and a bite, say roughly 45 minutes after the first pic was taken, I retook the pic on the right with my wrap so you don’t pass out, LOL! It was so cool I had to post the first one anyway because I couldn’t believe the difference in the range at motion at my ankle joint! Its huge! Yay for hydrating this amazing support structure! Remember the fluid we create with MELT continues moving long after our session!! This is much better medicine than what the doctor prescribed yesterday! Imagine not moving at all? I mean don’t cause pain, remember your body will let you know when you are doing too much! Love and Light! Day one of #INSPIREDYOGIS is ​”Tip Toes” – So here I am with my cast boot in #Tadasana – #MountainPose! Today worked out perfectly as the boot is so high, its perfect for lengthening up to the sky on my other foot!! I’m grateful for my practice, and having a major hand in my own healing process! Love and Light! My soft ball foot treatment was so cool – no pics unfortunately, but I sat on the edge of the bed allowed my left foot to touch the floor, again for this neurological feedback. It wasn’t flat of course, but still felt good! So after I finished my right foot and set it on the floor to assess how it felt, I noticed my left foot was completely touching the floor! So cool! These small little steps make me so happy I have such a hand in my own healing process! Today’s therapy also included some feather like strokes in the direction the lymph flows, think like using a lymph brush for circulation only with my fingers. It felt amazing! I also had included a full hand treatment! The following are some more before and afters, but the first one is the “mack daddy”!! Look at the difference in the swelling, the bruising has started to shift and move, the coloring has improved . . . unbelievably cool!! MELT really works guys!